We are haunted, we architects and historians; seeking knowledge in ephemeral traces and altered landscapes. We become intimately bound by the ghosts that we chase through the archives, longing for understanding through fragments of the practices and projects that are left behind. We seek resonances in the space, buildings and objects of the past. What of the spectres of history and geography that have haunted architecture’s production, and the dark shadows of influence and authority drawn between Europe and its colonies? And what of the architects we study; what reverberations of bankruptcy and inferior workmanship, self-doubts, critiques and unfulfilled visions are they plagued by? Specular and spectral colonial comparisons. Knowledge lost and recovered, archives absent and exhumed. The ghosts of misadventure, forgotten rituals, routines and procedures, and lost opportunities. Multiple pasts, the incongruities and dissonances of history; unsettled abject and uncanny spaces, places and narratives. Recurrent apparitions of architectural figures, whether canonical or outlying, within history and practice. Writing, drawing and photography as vehicles for figuring architecture’s spectres. 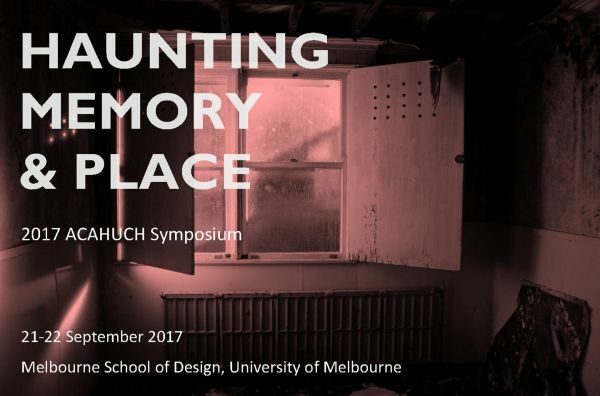 How particular architectural typologies, spaces or cities are haunted by confluences of fiction, myth, memory and popular culture, and acts of commemoration or desecration. The influence of the historic imagination in contemporary culture; its impact on our reverence of place and inhabitation, in the treatment of heritage fabric and ruins, and attempts to resuscitate and interpret through digital means. The pursuit of affect, reverberation and atmosphere in historical architectural sites. It is intended that selected papers from this conference will be published in the format of an edited book or special edition journal. For further details, please contact Dr Gareth Wilson, ACAHUCH Research & Project Officer.